5148 ⊙ 3PFVI 5 Pesa on 10 Pfg. 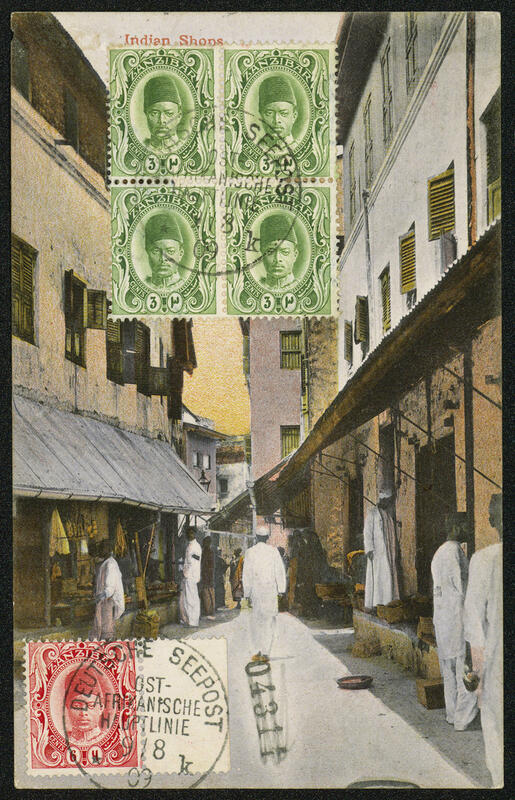 With scarce plate flaw \"wedge IN left frame line between the pages left above\", fresh colors, perfect centric cancellation \"DarÂ esÂ Salaam 27.9.96. \", expertized Richter. Michel 1200,- €. 5149 11/18SP 2-40 Pesa imperial yacht with overprint \"SPECIMEN\", fresh colors and in perfect condition mint never hinged In this excellent quality a scarce issue! Expertized Drahn. Michel 2400,- €. 5150 11PI 2 Pesa imperial yacht, unperforated proof, fresh colors and large margins all around, in perfect condition unused with original gumming. A very nice copy this colonial rarity! Photo expertize Dr. Hartung. Michel 3000,- €. 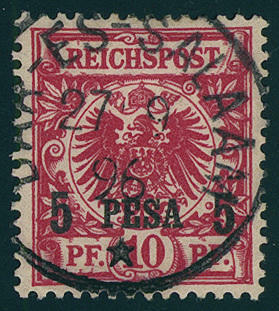 5151 ✉ 20I 60 lighter dark reddish carmine / brown black on dull carmine red, wonderful block of eight from of the right lower corner of the sheet with country inscription \"German East Africa\" in the margin on very nice registered cover with neat postmark \"MUANSA 2.6.10. 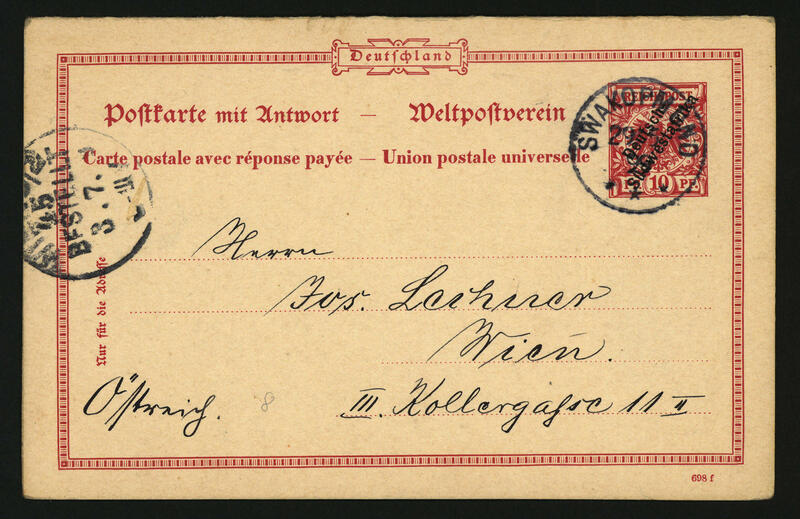 \" to Wilmersdorf with arrival postmark. On field 88 and 90 is in each case the plate flaw \"missing steam drawing right above\". A Honor for the sophisticated special collection in perfect quality. Photo expertize \"faultless condition\" Jäschke-Lantelme BPP. 5152 ✉ 27 30 H. Carmine / brown black, fresh colors, two perforation shortened, otherwise in perfect condition on complete international postal money order from \"TANGA 11.7.14. \" to Khilawad in Kathiawar (peninsula in India). The transfer amount amounted to be on 25 Rupee. 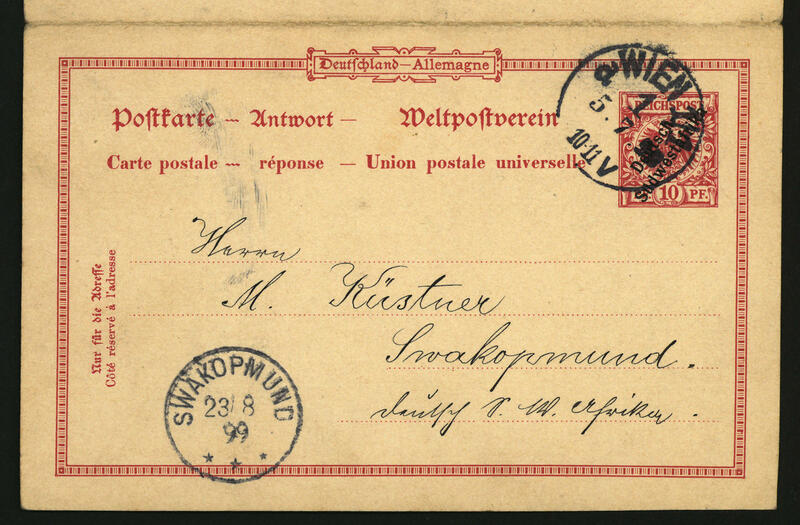 The international postal money order carries the signatur of the post office clerk. Because of the outbreak of war arrived the money order however no longer to the payment. Very decorative and rare! 5153 ✉ 28b 45 H. Red violet / black, two pieces as faultless multiple franking on postage exceeding tariff rate registered cover from \"MUHESA 31.12.13\" to Pangani with arrival postmark. The left stamp was retroactive cancelled in \"TANGA 1.1.14\". Very decorative, in this kind unique cover! Photo expertize Steuer BPP. 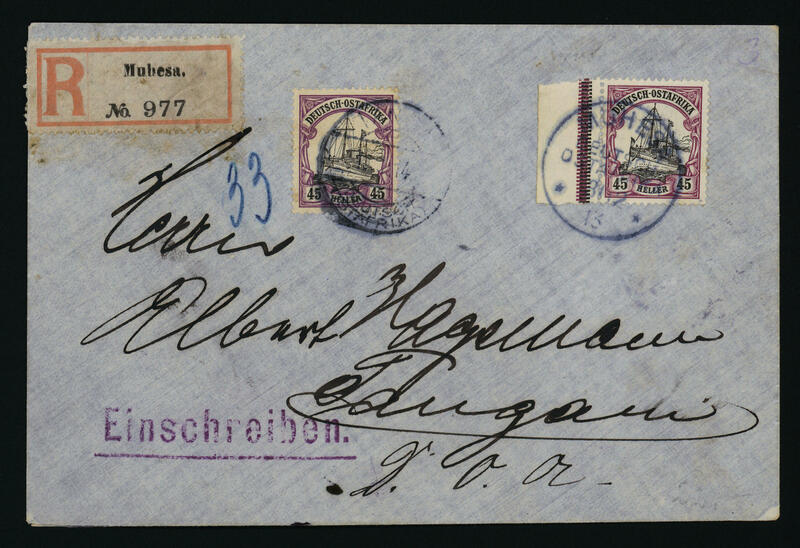 5154 ✉ 30,33 2 ½ H. And 15 H. In perfect condition on folded cover with scarce private stamp \"NYEMBE BULUNGWA German east Africa 25. 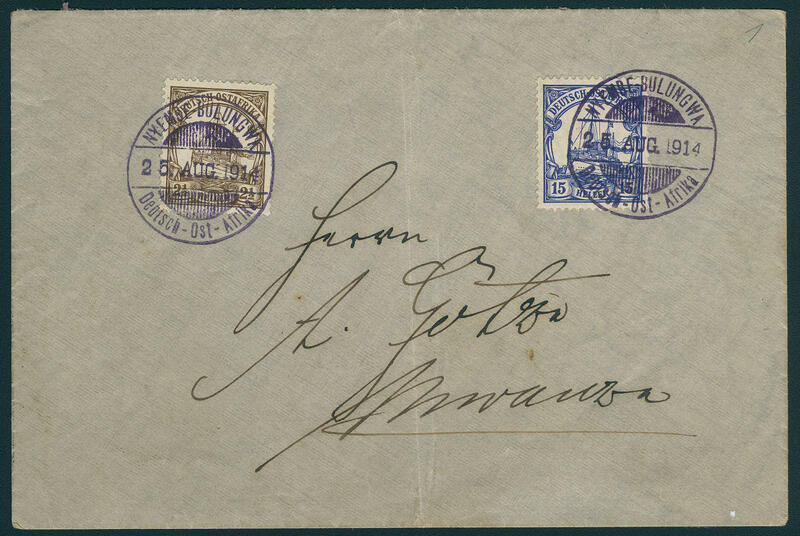 August 1914\" to Muanza addressed. An attractive and rare cover! 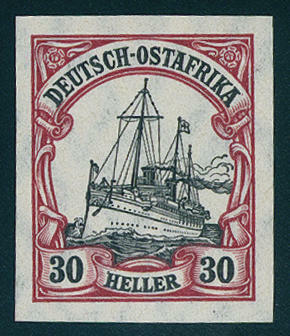 5155 ✉ 30I,33 2 ½ lighter (2) and 15 lighter on registered printed matter card with single circle postmark \"German sea mail EAST-AFRICA-LINE 27.4.07. 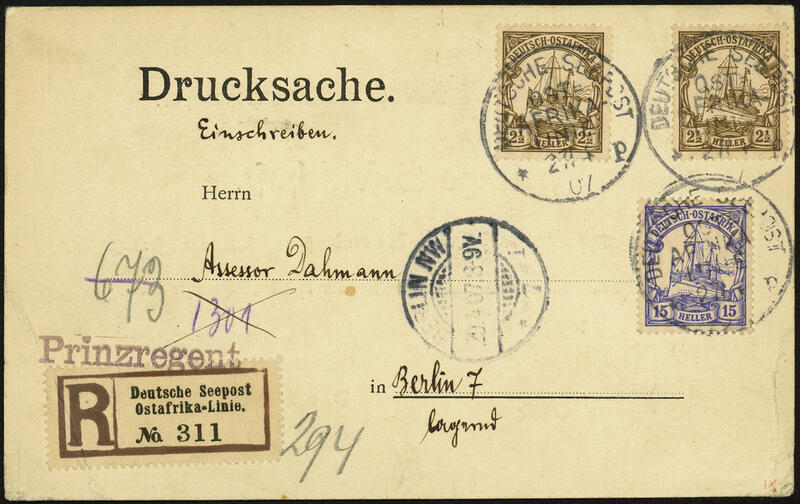 \" to Berlin with arrival postmark with appropriate registration label and violet one-line cancel \"Prince regent\". Very rare! 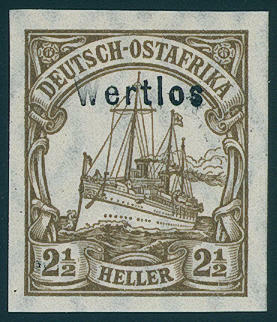 5156 30U 2 ½ lighter imperial yacht, four sides unperforated with overprint \"WERTHLOS\", fresh colors and in perfect condition mint never hinged, without any signs. 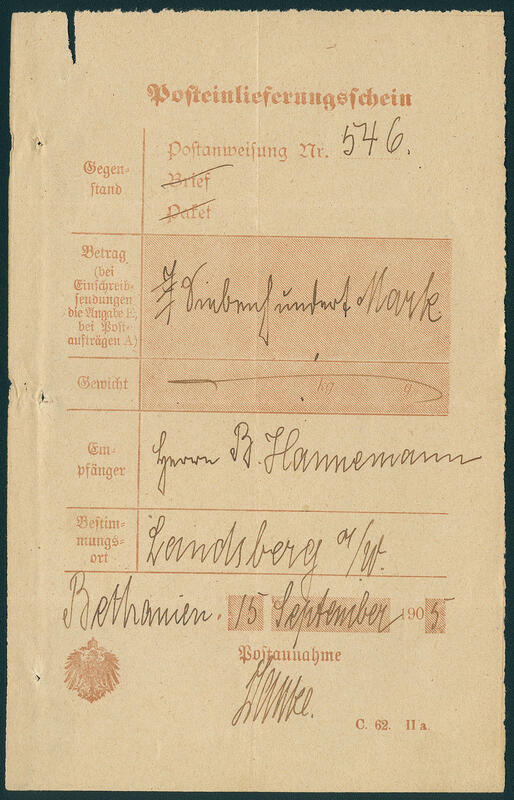 It is hereof only a sheet from the archive the Federal Printing Office (former Empire printing office in Berlin) have become known. This was 1996 public auctioned. 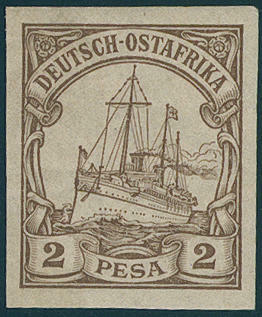 A rarity of the German colonies in utterly perfect condition! Photo expertize Steuer. 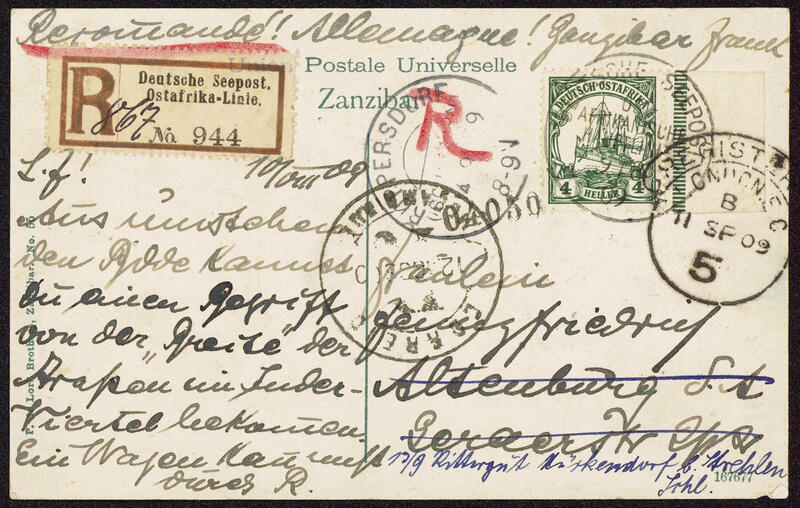 5157 ✉ 31 4 H. Dark green from right margin of sheet on registered postcard with reverse additional franking Zanzibar with single circle postmark \"German sea mail East-African Head line k 9.8.09\" to Germany with different transit and arrival postmarks. 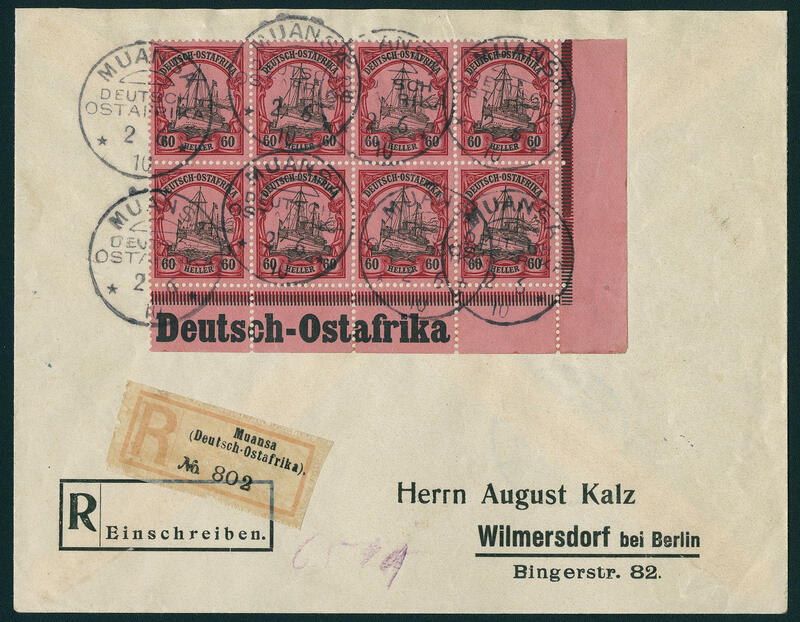 The franking becomes through the Zanzibar stamps covered. A decorative and delightful document! 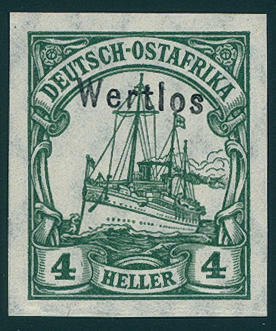 5158 31U 4 Heller imperial yacht, four sides unperforated with overprint \"WERTHLOS\", fresh colors and in perfect condition mint never hinged, without any signs. 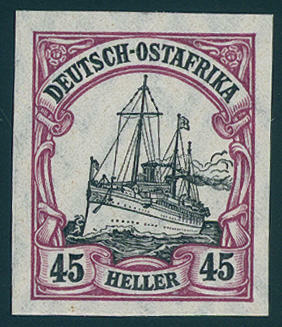 From of this variety is only a sheet from the archive the Federal Printing Office (former Empire printing office in Berlin) have become known. This was 1997 public auctioned. A colonial rarity in perfect condition! Photo expertize Dr. Steuer. 5159 35U 30 lighter imperial yacht, four sides unperforated, in perfect condition mint never hinged, without any signs. From of this variety is only a sheet have become known, the from the archive the Federal Printing Office (former Empire printing office in Berlin) comes. This was 1997 public auctioned. A colonial rarity in utterly perfect condition! Photo expertize Dr. Steuer. 5160 36U 45 lighter imperial yacht, four sides unperforated, in perfect condition mint never hinged, without any signs. 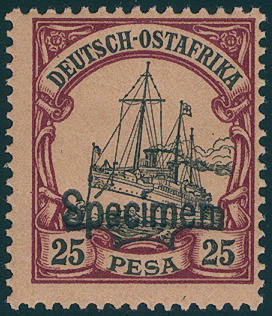 From of this variety is only a sheet have become known from the archive the Federal Printing Office (former Empire printing office in Berlin). This was 1997 public auctioned. A colonial rarity in perfect condition! Photo expertize Dr. Steuer. 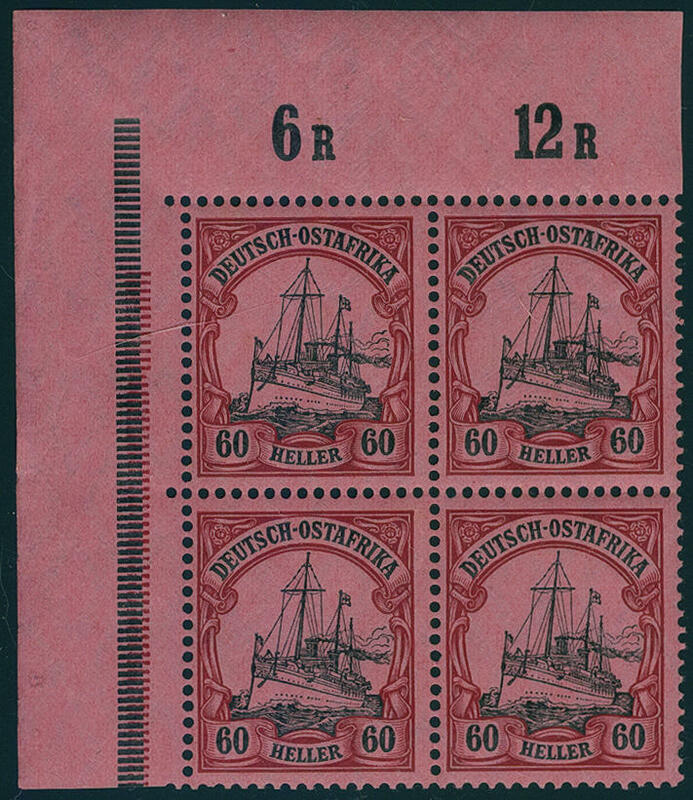 5161 37I 60 lighter dark reddish carmine / black on dull rose red, block of four from the left upper corner, wonderful fresh colors and very well perforated, unfolded, in perfect condition mint never hinged, without any signs. As well shows the right upper stamp the good plate flaw \"missing steam drawing right above\". A scarce unit! Photo expertize \"in perfect condition mint never hinged condition\" Steuer BPP. 5178 ∆ V37e,10 2 Mk. Dark red crimson in combination with 50 Pfg. 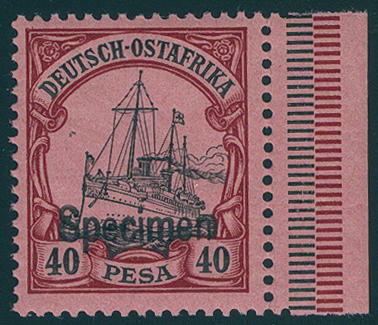 Bright red brown overprint German Southwest Africa, both values wonderful fresh colors and very well perforated on very nice money order cutting with all perfect clearly single circle postmark \"GIBEON 17.5.99\". An extraordinarily scarce and sought mixed franking! Dr. Steuer 2000,- €. 5179 ✉ V47b 10 Pfg. 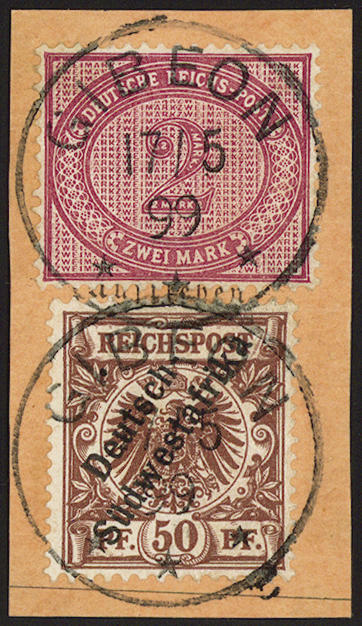 Brown rose in the horizontal pair, in perfect condition with clear box cancel of 2 lines \"from West Africa\" and additional red handwritten mailing note \"SWAKOPMUND\" on correctly franked franked commercial letter of the first weight step, slight traces, without sender lid, to Coblenz with landing stamp \"Hamburg 28.9.94\". 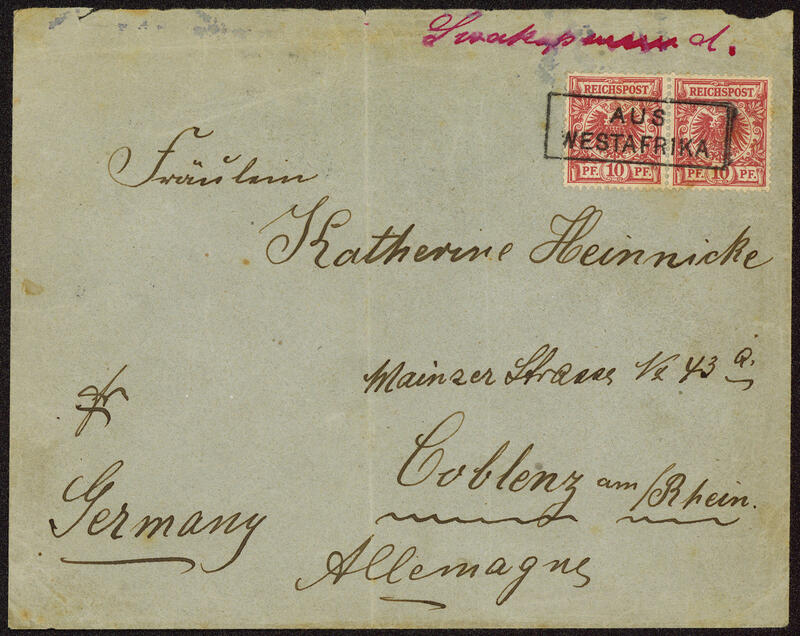 A postal history extraordinarily interesting and rare cover! Photo expertize Steuer BPP. 5192 ✉ PP4 5 Pfg. 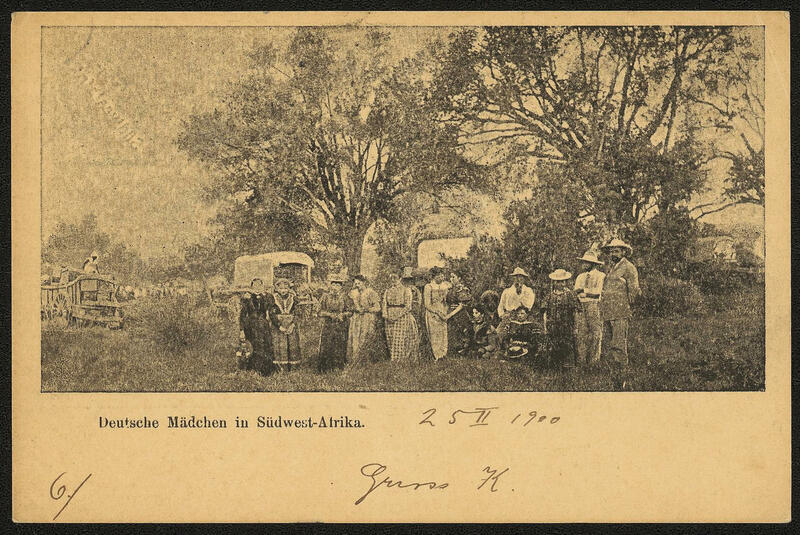 German-south west-Africa, extremely rare privat postal stationery with on the back picture \"German girl IN South west Africa\", left above minimum meaningless corner crease, with single circle postmark \"SWAKOPMUND 27.2.00. 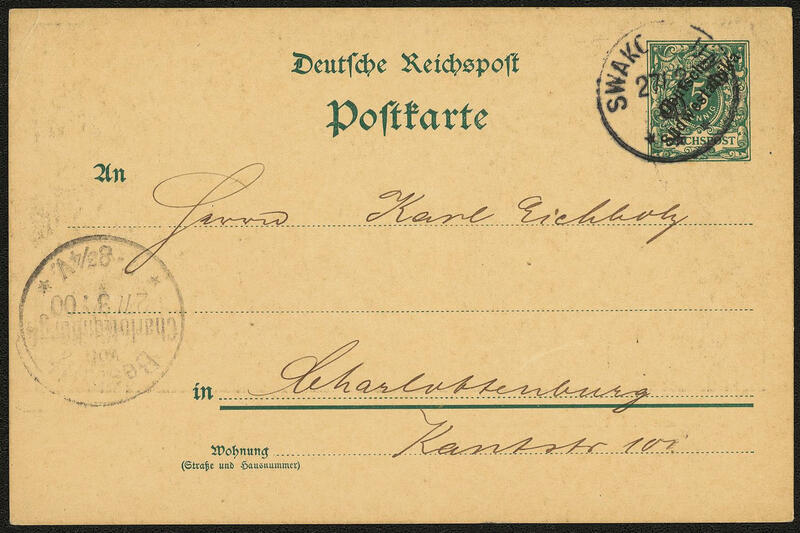 \" to Charlottenburg with arrival postmark. There are very few examples in this kind have become known! 5193 ✉ P8 10 / 10 Pfg. 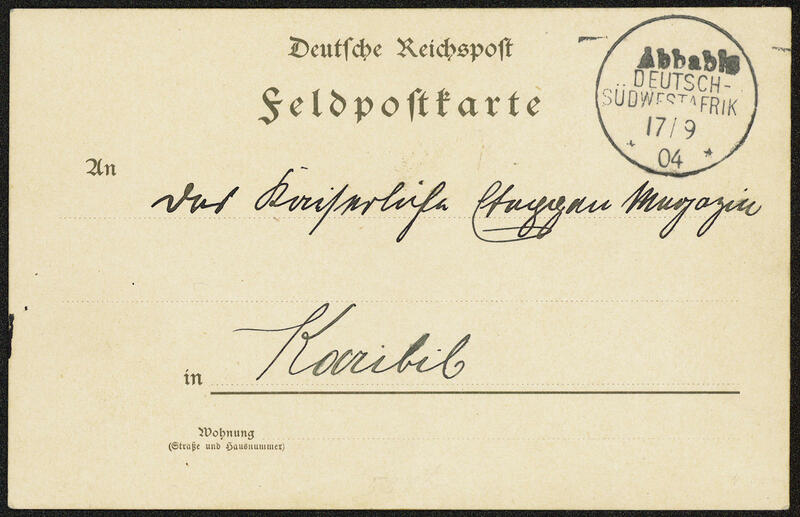 Carmine, double postal stationery, clean requires moderately used in perfect condition from \"SWAKOPMUND 29.5.99\" to Vienna with arrival postmark, as well answer part from \"Vienna 5.7.99\" to Swakopmund with arrival postmark. In this kind extremely rare! 5194 ✉ \"ABBABIS 17.9.04\", cancellation used in different places in black clear on very nice fieldpost card to Karibib, verso good violet two line cancel \"stages MAGAZINE KARIBIB\" and circle date stamp \"convalescent home ABBABIS DSWA\", rare card, expertized Bothe. 5195 ✉ \"BETHANIEN 15. 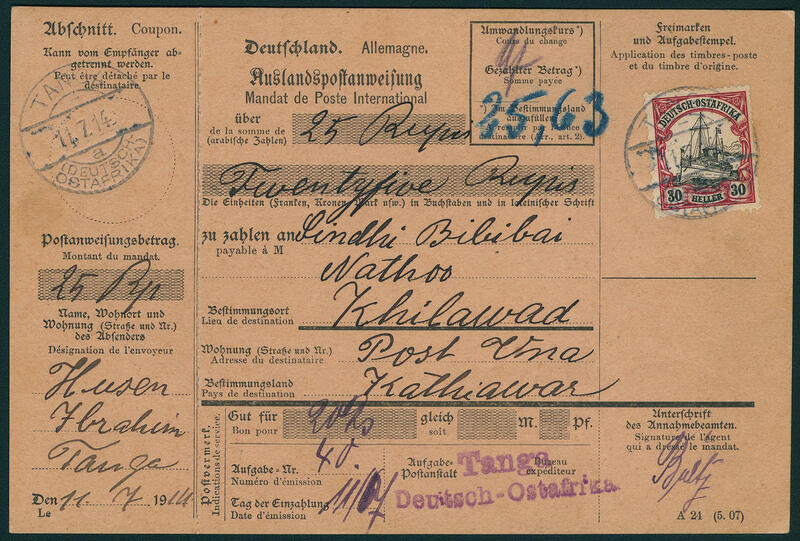 September 1905\", handwritten on postal service delivery certificate over a money order in the amount of 700,- Mk. To Landsberg. Rare!